Construction on the Kyaukpyu Deep Sea Port in the Rakhine state is complete and the facility will be ready to accept oil tankers in November, according to a local association and other sources. The port is on Maday Island east of the town and includes terminals as well as oil storage facilities. Docking can start in November, according to chairman of the Maday Island multi-development association Tun Kyi. While the port is ready for opening, it is not deep enough to accommodate at least one oil tanker that is already scheduled to arrive in November, according to information provided on October 10 from one member of the Kyaukpyu Deep Sea Port Watchdog Committee. 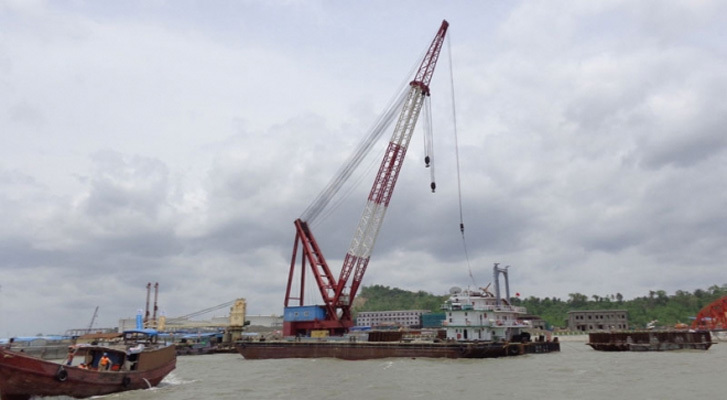 U Saw Moe Kyaw told a publication that the port can accept a draught of up to 62 feet. Draught is the vertical distance between the bottom of the hull and the waterline. But the expected 300,000-ton liner is larger than that, causing a delay in the port’s commissioning. The port authority is working with Chinese experts, he said, to attempt acceptance of a oil tanker with a 70 foot draught in November, but that vessel will not easily fit into the port. An additional deep sea port on the same island in being planned and construction should begin soon, according to the same source. Residents of the area are likely to demand compensation for lost land, however, that is being used to develop the special economic zone at Kyaukpyu. Local residents protested the loss of land for the deep sea port project previously.